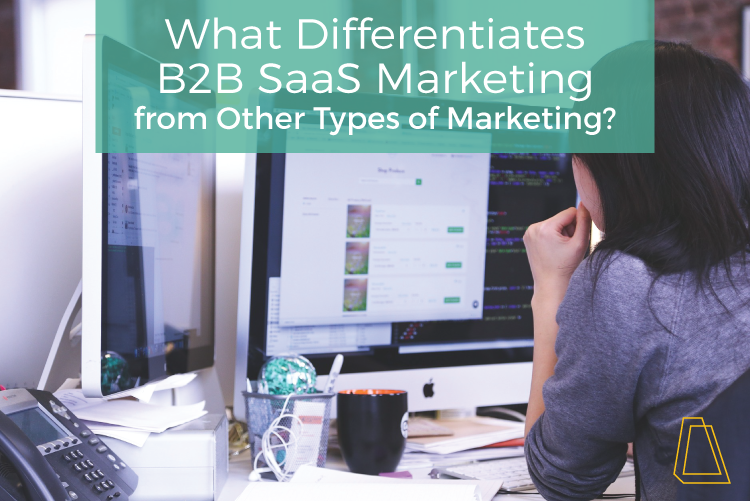 What Differentiates B2B SaaS Marketing from Other Types of Marketing? There is no way around it—marketing is hard. Whether you’re trying to market a product or service that is constantly changing, or something that only appeals to a niche crowd, finding the right strategy is no easy feat. Over the years there have been many different and new types of marketing, all of which claim to be bigger and better than the rest. One of the most widely used and impactful forms of marketing today is B2B SaaS (software as a service) marketing. SaaS marketing is challenging, to say the least, and it is also quite different from pretty much every other type of marketing strategy that exists. It all depends on information and content. We all know that content is king when it comes to any type of marketing, but this is especially true of SaaS marketing. If you are a SaaS marketer, it’s important to remember that others are turning to you for information. Whether you are blogging, tweeting, sending out emails or doing anything else within a B2B SaaS marketer’s job description, it is absolutely imperative that everything revolves around the propagation of information. In fact, the large majority of SaaS is designed around this very idea of providing information that leads customers to actual product. SaaS clients are loyal and long-term. When it comes to SaaS marketing, the majority of your revenue will come from your current customers. A recent study indicates that upwards of 80% of all revenue you create in the future will come from 20% of your current clients, which is huge. This is perhaps the biggest differentiator between SaaS marketing and other forms of marketing. Customer retention is the key to success here, more so than any other area. By focusing on how to create long-term customers and what these retention numbers actually mean to your overall value, you will have a much better chance of finding success. You are selling a service, not a brand or a product. It says it right in the acronym—Software as a Service. While the software is obviously a huge part, let’s take a minute to focus on the aspect of service. When building a strong SaaS marketing plan, it’s critical that you take the time to understand your customers and cater to their needs. Everyone from the developers and programmers to the sales team, bloggers and marketers play an instrumental role in how successful a SaaS marketing plan is. The best way to sell your SaaS product is to focus on service and hold yourself accountable in the eye of your customer. SaaS marketing provides a centralized solution for clients by offering a service that can help them whenever they need it. As software continues to change and evolve with the introduction of new technologies, etc., so will your marketing strategies. Focus on service and offer great support to create a product that sells itself; in doing so, you’ll be met with a whole new type of success that is here to stay. How do you market your B2B SaaS product? Let us know in the comments below. If you’re looking for additional help with B2B SaaS marketing, check out our ebook, B2B SaaS Marketing: Selling the Intangible. Is your B2B SaaS company in need of a marketing boost? Contact Milwaukee B2B SaaS marketing agency, Accelity Marketing.